I wanted to make some really quick and easy mini ornaments for my Spring Tree. But what could I make that was cute, colorful, & packed a punch all at the same time? Of course … a lovely Stroppel Cane Easter Egg! 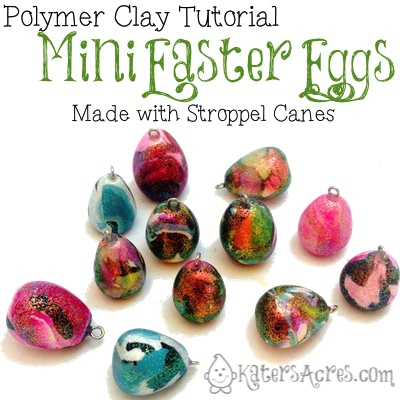 So here’s a super quick, fun, & easy project you can whip up for your Easter fun. Cut off a slice of your Stroppel cane. Roll the ball into an egg shape. Using ultra-fine glitter, roll your egg in the glitter. Important: Once your egg is covered in glitter, roll it in your hands to fully embed the glitter into the clay. This will ensure that when your piece is finished the glitter doesn’t rub off. If you have changed the shape of your egg, change it back into an egg. Cut headpins 1/2 the length of the height of your egg. Place TLS or Bake & Bond on the tip of the wire. Insert it into your egg. Bake at 275 degrees for approximately 1 hour (time is dependent on the size of your eggs, my eggs were 1″ tall). To keep the glitter from rubbing off, seal it with a coat of varnish. If you make your Stroppel Cane with white clay as a base, instead of black, your eggs will be much lighter in color & more perfect for spring. I used what I already had made, but if you don’t have a Stroppel Cane made, make a new one with white as the base. Use them as ornaments & hang them on a seasonal tree. Decorate Easter candy bags with them! Put them on a chain for a cha-cha style bracelet. Use it as a pendant for a Easter necklace. Make them without headpins & place them in mini-woven baskets for Easter. Make a polymer clay basket and place these inside them. They’re so cute Katie, Thanks for using a Stroppel Cane once again!